Not only do we provide award winning accommodation at Smallicombe we also pride ourselves in the quality of products we supply. Not only do we produce scrumptious meat, from our rare and traditional breeds, we also manufacture quality products wool products from the fleece of the sheep. Our animals go to a small local abattoir, the sheep skins are processed in a South Devon tannery using traditional methods and our fleece is processed in a small artisan mill in North Wales. If you are staying in our self-catering cottages but would also like to taste our traditional farmhouse breakfast you can either order one of our breakfast hampers or even have a cooked platter delivered to your cottage in the morning. 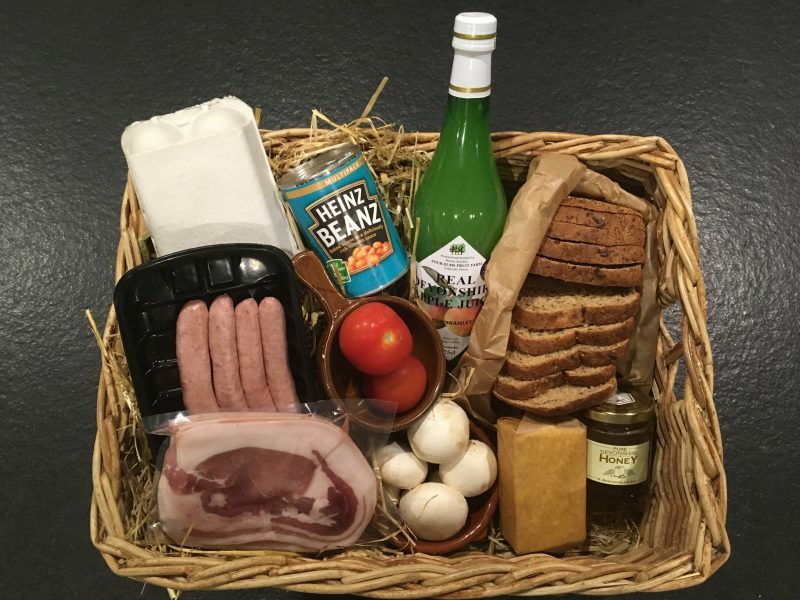 Our breakfast hampers includes everything you will need to replicate our award winning breakfast with the option of sampling some additional local products including apple juice, honey and bread. Visit our shop for details. Our Devon beef cattle and Dorset Down sheep are reared outside and supplemented only in mid-winter. Both breeds are chosen to suit the area and produce meat unsurpassed in texture and flavour. The animals go to a small local artisan abattoir only 6 miles away. The beef is hung for a minimum of 3 weeks before cutting. Our pigs are either Berkshire, British Lop or Saddleback all noted for the superb flavour and texture of the meat produced. All the meat can be cut to individuals requirements. 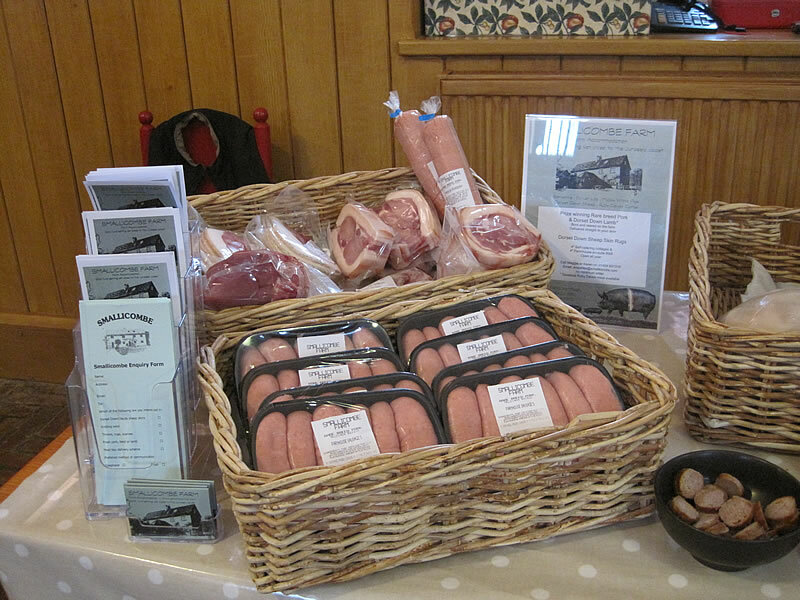 The abattoir cures for bacon and gammon, using a traditional brine cure, and makes superb flavour farmhouse sausages. The meat is vacuum packed and individually labelled for sale. We sell direct from the farm. If you are staying with us, and want something specific, please call for details. We do not list all our meat stock, as it varies week to week, and we are happy to produce specific cuts if required. We also sell half or whole Dorset Down lambs. The Dorset Down sheep is a traditional West Country breed renowned for its excellent quality fine fleece. We have also crossed the Dorset down Ewes with a Jacob and Zwarble ram to produce a natural brown colour to mix with the cream. We send the raw wool to a small artisan mill in Rhydlewis in Wales. We have designed products to best show the attributes of the two wools. 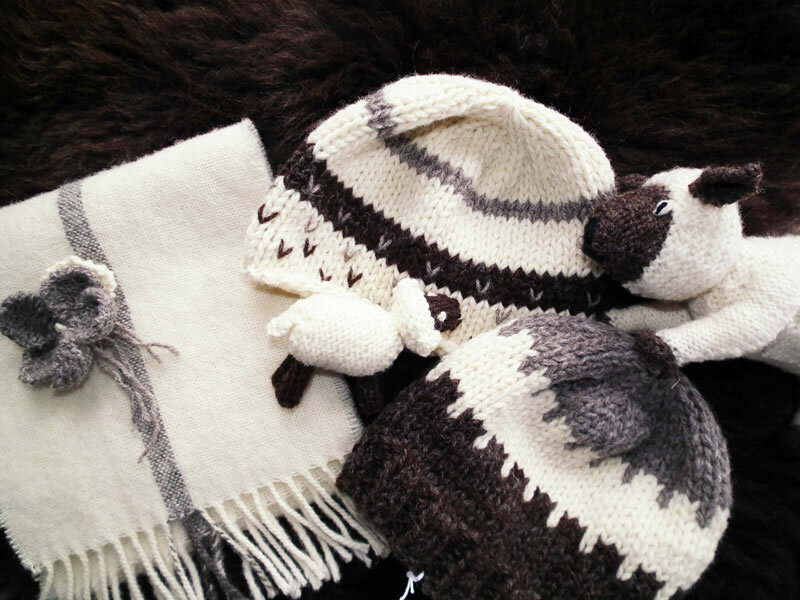 We have stock of scarves, and various size throws plus knitted hats form our wool. The Natural Fibre Company in South Devion has also spun some of our wool into 80g double knit balls. In additional to our wool products we have our skins tanned, producing both sheep and super soft lambskin rugs, at Devonia in South Devon. Please look at our shop for details. All our sheep skin rugs are unique, with different coloured wool and various sizes, so if you are after anything specific please call for details.